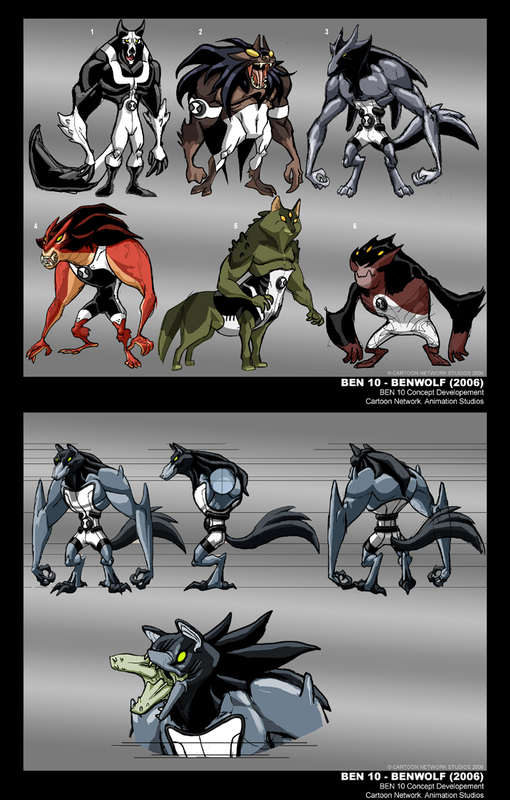 Early Ben 10 Art - Ben10Toys.net for Ben 10 Toy Fans! 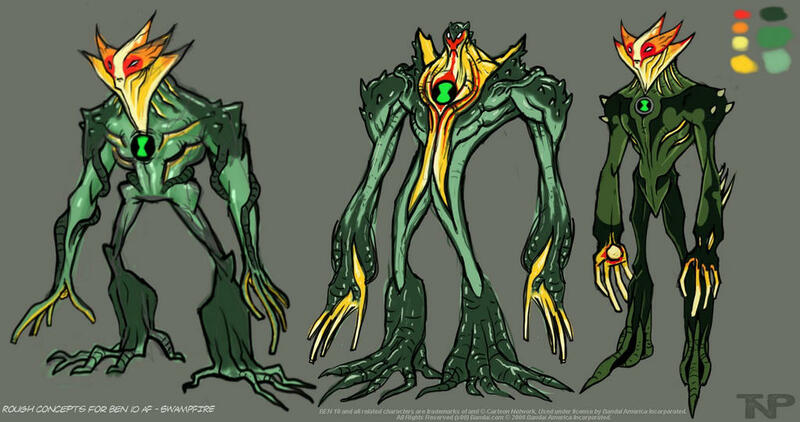 This'll be interesting, through the internet I have recently discovered some old Ben 10 Concept Art, some of it dating all the way back to PRE-Original Series. So, let's get in to that. Let's start with Tom Perkins, he's one of the art directors from OS, did some freelance work for AF, and I think he works on OV now. Important Note: Remember the Bandai Ben 10 DNA Lab? He drew all of the fusions! Looks like #10 was the one they officially went with. Ok, this one is interesting, the closest thing we have in the Concepts is #3 over there. First of all, 10d's design is the closest thing there is to the Real Upchuck, but sadly they canned the blob of green stuff in him, also, as you can see, 1 and 5 were reworked into Enemies for the Ken 10 episode. This one is very interesting, as some of you may know, Swampfire "Aged" in "Charmed, I'm Sure", he looks like the far right design now, more or less. To round things off from Tom Perkins, we have 5 Unused fusions! They seem to be Greyvine, Greymummy, GreyViktor, Greychuck and Cannonmatter. Now we move on to some Pre-Original-Series stuff, courtesy of Steven E. Gordon. This, no joke, is what Ben was going to look like at one point. Early Omnitrix Concept, looks alot like the Alien Force one. Forget our Ghostfreak, this thing is way scarier! Wow, it just screams "Little Green Men" stereotype. Early Heatblast draft, not much else to say. Again, not much else to say, it's just Fourarms in his earliest known form. It's Upgrade! but not the one we know! No, it's FAR from that. Maybe we could count this as "What Kinecelerans might look like with no helmet"? And we'll finish this off with something special. These, right here, are the only known screenshots of the Unaired OS Pilot, as you can see, it's the Grocery Store scene from "Washington B.C. ", sadly, like I said, this pilot has never been aired. WOW..This is some pretty awesome behind-the-scenes stuff...thanks for sharing! anyone also notice the change in ben's hair in the last 2 photos? This isn't exactly new, but it's nice to see it compiled, I guess. I love to see Perkins' work and process, he comes up with so many workable and rad designs. He also put up a really awesome page of Captain Kork concepts. That guy is really good. Some of these are sick. What I find interesting is Swampfire with copyright 2008 and he now looks like the last one as last week .